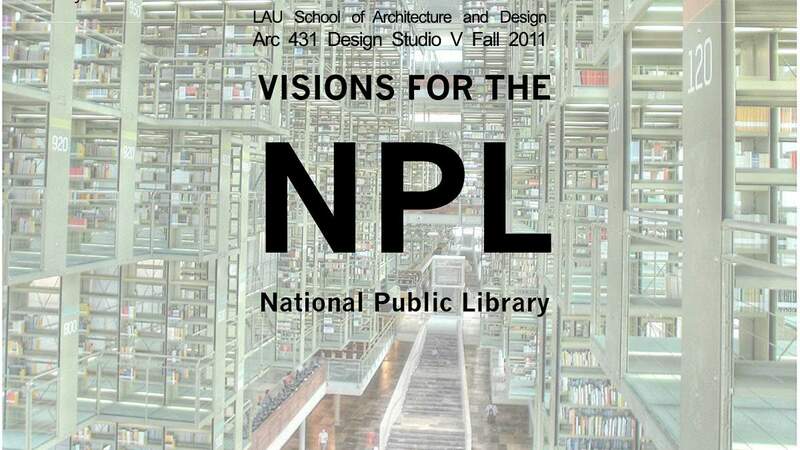 Sandra will teach an architecture studio at the Lebanese American University's School of Architecture entitled: visions for the National Public Library; which will rethink space of knowledge in the digital age through proposals for the national public library. How is knowledge to be housed today? We live in an age in which digital communication and media are undermining the culture of the printed book and physical storage, re-questioning the role of the traditional library along the way. What should the library of the 21st century be then? Should it change its identity to become a mediatheque, workshop, lab, public space, “cultural entertainment” center, innovation incubator? Should it adopt a double identity, bridging the worlds of print and digital documents? Or should it simply disappear into virtual servers ? This studio will attempt to address such questions through design proposals for the National Public Library. The new library will occupy a triangular plot on the former Green Line, facing Sodeco square and the Barakat building. It is a ﬁtting site for exchanges, on the civic, infrastructural and informational levels. The studio will combine design speculations on the future of the library as an institution of knowledge, a national monument and a public cultural space with an advanced exploration of the various technologies and systems that enables it. We will focus on the intersection of both media and material, with a special emphasis on the performative aspects of architecture. In addition to organizational and spatial strategies (the library program), we will look carefully at the mediation of flows, light, sound, and the environment. The intent of this studio is to update the concept of the library and to call on architecture to play a new active role at the interface between the electronic, the physical, and the social.